Hard water can be the bane of your existence. Hard water stains on all your dishes and appliances makes cooking and cleaning frustrating. A lot of the fresh water sources at a campsite will have really hard water, which can dry out your sink and leave all you clean dishes looking cloudy and gross. All the scale build up is really hard on appliances. Even something as simple as an electric tea pot will last barely a year with hard water scale build up. Hard water can end up costing you hundreds if not thousands in the long run. 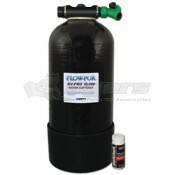 In a house this problem can be very costly to fix, but in an RV portable water softeners are very affordable. Save hundreds of dollars by getting a portable water softener and protecting you appliances and plumbing fixtures. 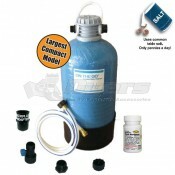 At Dyersonline.com our portable water softeners are easy to use and offer a low cost of operation. It also will not dramatically drop your water pressure and it regenerates with just regular table salt. Easily provides two people with up to 14 days of water in a cycle. With soft water you skin will feel better and you will even get a better soap lather, which means you don’t have to use as much. 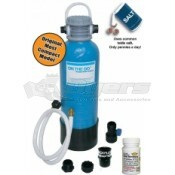 A portable water softener is an excellent investment and has low cost of operation and is very easy to use. A regular hose connects from the water collection site to the RV and the kits come with adapters and everything else you need to use. When you receive the unit you don’t even need to add salt just plug it in and reap the benefits. Be amazed at the high flow rate and great water pressure you can get with these, compact, easy to store portable water softeners.